Buttermist® contains the actual flavor of natural butter from Wisconsin… flavor that is captured, concentrated and blended with premium canola oil. Spray Buttermist on unheated cook/bakeware. Before baking, spray top of rolls, bread, and pastry to give a natural butter sheen and flavor. Buttermist had a very high smoke point (>450° F). 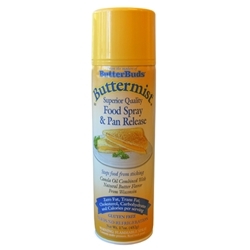 Buttermist is fat free, cholesterol free and low in sodium.